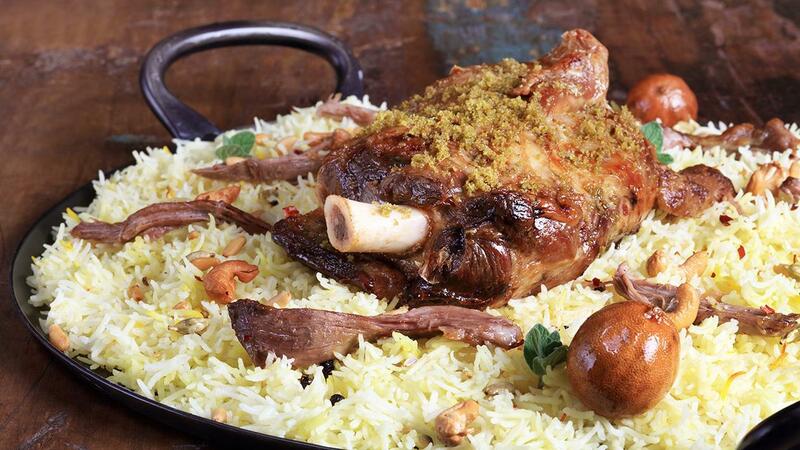 Machboos is one of the UAE’s favorite meals and is a perfect Iftar meal showcasing rich Emirati heritage. We have given this dish its own flare with our marinade spice solutions. A great recipe for everyday of Ramadan. Wash the lamb meat thoroughly with cold water then pat dry with paper towel. Rub the Knorr Coating Mix Marinade on the lamb and marinade in the fridge for 4 hours or more. In a pot heat the Rafhan Corn Oil and toast of the cinnamon, cardamom and dried lemon till fragrant. Place the lamb in the pot and cover with water, and cover with lid. Simmer for 2 hours till tender and skim the scum every few minutes. Once tender remove the lamb and reserve the stock. Cook the rice with saffron and 1.2 liter of the Knorr Chicken Stock Powder. Bring to the boil, then turn down to a simmer, cover with a lid and cook for 10min, then turn off the heat and steam for 10 more minutes. Shred the boneless lamb and mix through the rice. Plate the rice on a platter, rest the shoulder on the rice and garnish with cashew and Zaatar.